The McNair Scholars Program helps students reach their graduate school goals by offering a unique research experience during their undergraduate education. Participating students spend an average of 400 hours exploring their topics, developing a thesis, collecting and reviewing data, and preparing a formal presentation of their findings. Research provides the opportunity to develop a mentoring relationship by working one-on-one with a faculty member, gain extensive skills and knowledge in a discipline, learn methodological techniques, and practice writing and public speaking by submitting papers to professional conferences and journals. Research also helps prepare students for graduate study and gives them a resource for obtaining strong letters of recommendation. During the 2012 spring semester, physics professor Benjamin Stottrup and McNair assistant director Brian Greening taught the McNair 301 course in which scholars completed their research proposals. 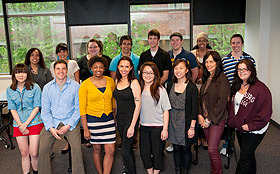 The current class of McNair Scholars is pictured above with Tina Tavera, McNair Program director, Brian Greening, and Lara Crombie. Barrick's summer research hinges on building and cultivating a community garden in his home town of Litchfield, Minn. He intends to enhance garden members' knowledge of three entities: aspects of Dakota Culture, organic farming in the Meeker County community, and available resources for healthy living. He also hopes to re-introduce affiliates to the historical significance of the Litchfield region in relation to the U.S.-Dakota War of 1862. Members will learn how to use local ties to health, awareness, and activism to inspire and cultivate a more self-aware community. Using Erving Goffman's theories on impression management and frame analysis, Benser will focus on identifying methods employed by comedians and determining which techniques are successful in framing comedy, especially that which surrounds controversial topics such as race and sexual orientation. Darden will complete two academic projects this summer. She will conduct physics research with David Murr and, as a 2012 Phillips Scholarship recipient, she will complete an internship with the Girls in Engineering, Mathematics, and Science (GEMS) and Guys in Science and Engineering (GISE) programs. In GEMS and GISE, Darden will teach students about structural engineering through the use of bridges. Elkington will study the conceptual ideas of practicing, licensed psychotherapists who also perform Shikantaza Zen meditation. Through this research, he hopes to determine whether and to what extent a practitioner of both psychotherapy and Zen believes there is a synergism between the two. Genis will use reproductive justice—a movement that resulted in the formation of a reproductive health collective—to explore the concept of intersectionality and its influence on grass-root level coalition-building. Through interviews and participant observation, this study will address the following questions regarding this movement: What shape does intersectional activism take on an individual level in activism? What factors led activists to see their bodily experience of reproduction through a political lens? How do reproductive justice activists identify with the movement? Moua asserts that instrumental Hmong folk music is largely unknown to most people; thus, her personal goal is to help make Hmong music a known quantity and disseminate it to the wider community. Moua will interview teachers and students of instrumental Hmong folk music and explore the structure and form of the music in order to make it accessible to everyone. Ultimately, Moua hopes to contribute to a growing archive of Hmong history. Olson will examine how the brain differs among states of perception. By performing visual stimulus tests using dots in random motion, he will be able to dissociate perception from stimuli. The dissociation will be mediated by change between connectivity of the brain. It is hypothesized that during a perception state, more connected activity between areas of the brain will be seen. Based on a previous study, a stable state of communication during a perception state was suggested. This stable state will be measured by analyzing the connectivity between cortices of the brain via magnetoencephalography (MEG). By using narrative theory and frame-theory, Ritchea will map the story world created by J.R.R. Tolkien in order to better understand his series of work and get a basis for the creation of imaginary story worlds. Ritchea's goal is to develop the template for a software application where fans, readers, writers, and scholars can enter coordinates based on page numbers, passages, and/or specific characters/lines to get an illustration of where they are in the textual world. In an effort to conserve the endangered chimpanzee Ngogo community in Kibale National Park in Uganda, Stauffer will create multiple models that display the intrinsic and extrinsic effects acting on the community. Modeling shows what potential outcomes in the presence of extrinsic factors could look like and how these varying factors influence the growth rate of the community. Upon completion of the analysis, Stauffer and her mentor will form a management plan that may potentially give direction to conservationists and scientists involved in protecting the Ngogo chimpanzees. After gaining knowledge of music therapy and delving into psychological theory regarding the influences of popular culture, Tillman seeks to explore how music can positively influence individuals. She wants to focus on African American adolescent girls and determine how certain musical forms affect their self-esteem and attitude. Yang will examine the two recently-passed online copyright bills—The Preventing Real Online Threats of Economic Creativity and Theft of Intellectual Property Act (PIPA) and the Stop Online Piracy Act (SOPA). Both bills were created to protect and enforce the copyrights laws in the U.S. Yang hopes to show how one could amend the legislation to ensure that internet businessescan continue to thrive without fear of piracy or interference from government agencies. Interviews will be conducted with representatives from Google and state legislatures to discuss how SOPA and PIPA can affect businesses negatively, even when those businesses have not violated copyright laws. Attention Deficit Hyperactive Disorder (ADHD) is a neurodevelopmental disorder. Previous literature has focused on ADHD in adolescents, but it is still unclear as to how ADHD affects individuals later in life. This study will examine the association between ADHD and various functioning outcome variables, including educational attainment, occupational performance, delinquency, driving safety, internalizing factors (such as depression and anxiety), and inter-personal relationships. Assessing individuals at ages 18, 20, and 22, Young predicts that individuals who were diagnosed with ADHD during childhood will report lower functioning as a young adult compared with individuals who did not receive this diagnosis during childhood. P. aeruginosa is a common bacterium that can survive in a wide variety of environments and is commonly encountered in everyday life. This resilient bacterium does not infect healthy tissue but can heavily damage any compromised tissue. P. aeruginosa infection is responsible for 50 percent of case fatalities of patients who are hospitalized with cancer, cystic fibrosis, and burns. The purpose of this study is to explore strategies with which the healthy lung inhibits biofilm formation by P. aerugionosa and to determine which of these strategies is not employed in the lungs of people with cystic fibrosis.